Modern students who are drawn to the study and practice of Buddhism are not always able to easily learn the symbolic meaning of the various types of statuary connected to the study of this philosophy. 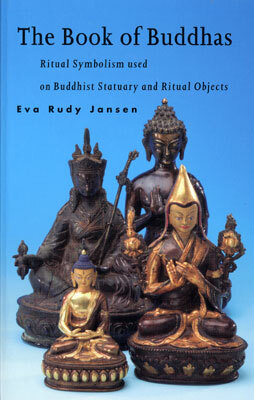 In Buddhism, every symbol has a meaning, and this book explores the symbolism of the ritual objects that are used on statues and paintings, as well as explaining the ritual meaning of the objects associated with Buddhism. This book serves as an introduction for Western students. It is not a comprehensive and exhausting study, but provides an introduction to Buddhism itself, as well as a generous survey of the most common figures and symbols. The author examines the Three Mysteries, mudras, asanas, Manushri Buddhas, Transcendental Buddhas, Adibuddha, Tara, Manjushri, and Avalokiteshvara. Also discussed is Yidams, Gods and goddesses, dakinis and yoginis, and the Laughing Buddha.